Beckoned, Peter steps out of the boat. Moving in one solid motion, from a place of fear and uncertainty to a brief but shining moment of pure peace. Peace that literally passes understanding. There’s this wild sense in this moment that Peter is caught up in a whirlwind kind of soul romance with the man calling him out. What is Peter really saying here? Wind whipping round, sea spray soaking face, hair, beard, the sound of roiling waves and shouting men, Peter meets the eyes of Jesus, looking out across the sea to find his friend walking on top of the water. Peter, a fisherman by trade, has worked his entire life to master the sea. Going out in all manner of weather, working against contrary winds and turbulent waves, knowing days of scarcity and of abundance, a fisherman would have had a great respect for the sea. There is a reason the men in Peter’s boat are afraid. No doubt skilled swimmers, they are well aware that going into the water in the kind of torrent in which they find themselves means death. Then, out of nowhere, they spy the figure of a man walking on the water. In moments of fear, don’t we go back to our most basic and simple understandings about the world? We’re certainly not at our most rational. Perhaps these men spotted Jesus and remembered tales told them at their grandfather’s knee about ghosts in the water. Perhaps they thought of Him as a sure omen of death. Whatever it was, these men move from the practical adrenaline pumping fear of fighting for their lives against wind and wave to the heart stopping fear of children hiding from the Boogey Man. They move from a fighting fear to a frozen fear. And then Peter moves to a faithful fear. I wonder if Peter wanted to grab those words as they escaped his lips and cram them back down his own throat before they had the chance to traverse the distance to Jesus’ ears. Call me out with You, into my fear, into what masters me, into that which is bigger than I, into that upon which I depend for life. Call me out, and I can stand with You on top of it all. Jesus beckons Peter out of the boat and Peter, locking eyes with His teacher, boldly steps out to a brief and shining moment of victory over a lifetime worth of adversity, uncertainty, failure, and fear. We all know what happens next. Peter catches a glimpse of towering waves in his periphery. He begins to sink. Jesus didn’t calm the water. He didn’t stop the wind. He didn’t say “Okay, I’ll call you out, just wait for me to tidy up a bit first and roll out a red carpet for you.” No. It’s a madman’s love that drove Peter out of the boat and into a storm, and it is a Divine Madness that would call him out in the first place. 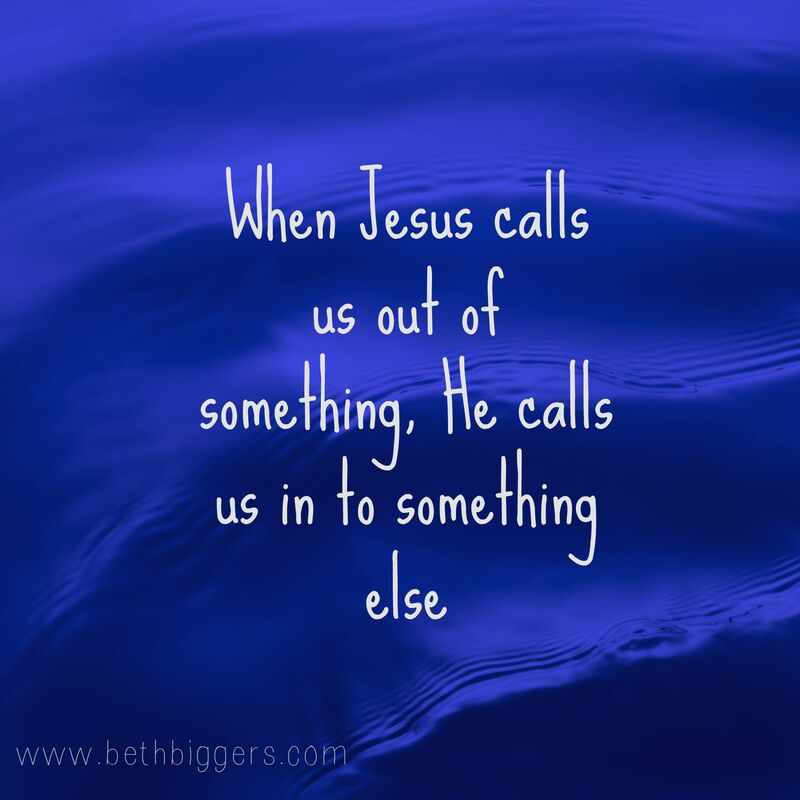 Someone much wiser than me once exhorted me with this counsel: When Jesus calls us out of something, He is also calling us in to something else. Jesus called Peter out of the place he had always known, completely out of his lifetime relationship with reality. He called him in to a place of victory, a place of spiritual reality where death and fear and even the laws of physics bow to a heart locked eye-to-eye with Jesus Christ. What things do you find yourself clinging to or depending on? What things do you find yourself in fear of? Do you sense Jesus calling you out of those things? If so, be encouraged that as He calls you out, He is simultaneously calling you in. Into a deeper relationship with Him. Into a place of victory over the things which currently hold you bound. If He is calling you out of the boat, know that He is also calling you to walk on water. I think it’s worth the risk, don’t you? Learning to be a water walker…this theme keeps popping up all over in my world this past year. It’s far too easy to focus on the wind and the waves. What a glorious thing, to ignore the storms and walk on the water with Jesus. We are learning, aren’t we? Grace and peace to you! I love this post! For a long time I’ve known that Jesus has been calling me out, and that He doesn’t want me to look in fear at the wind and waves, but I haven’t really thought about what He is calling me to. Thank-you for giving me some food for thought!